Sounds like serious blood. A parent should want to have asked the kid what happened, right? Quote: The staff had left a note in a message book at the swimming-pool reception area, asking that the same table, which overlooked the apartments, be block-booked for 20:30 for the McCanns and friends. The message said the group's children were asleep in the apartments. Madeleine's mother believes the abductor may have seen the note. Is that normal for hotels to have notes on this kind of thing? Quote: The McCanns and their friends left the restaurant roughly every half-hour to check on their children. 5A's patio doors could only be locked from the inside, so to allow them to enter that way, the McCanns had left the patio curtains drawn and the doors closed but unlocked. Ok, so how about just to enter a different way, and to keep all the doors locked? Quote: Madeleine's mother had intended to check on the children at 21:30, but Matthew Oldfield, one of the Tapas Seven, offered to do it when he checked on his own children in the apartment next door. 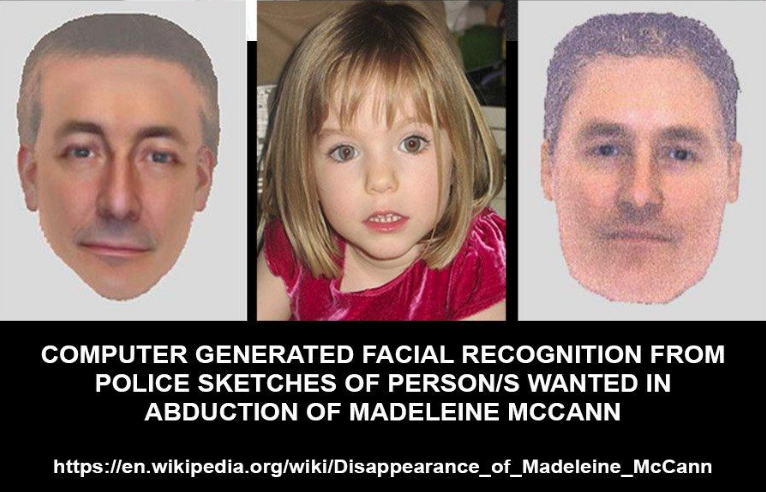 He noticed that the McCanns' children's bedroom door was wide open, but after hearing no noise he left their apartment without looking far enough into the room to see whether Madeleine was in bed. So what is the point of checking on her? Maybe inside job - family, friends or hotel. The sighting of a man carrying a small girl through the streets of Praia da Luz just before 10pm on May 3 is an important sighting because it also blows a huge hole in the alibi of Gerry McCann. For newcomers to the Madeleine disappearance, the story goes like this: A family—Martin Smith and eight others—were leaving a bar in Praia da Luz and walking back to their apartment around 9:45pm. They encountered a man hurrying through the streets carrying a small girl and their reaction was that it was a man and his daughter. 4 months later when Martin Smith was watching television back home in Ireland, he noticed Gerry McCann disembarking the Easyjet plane at East Midlands Airport while he carried his sleeping son, Sean. The sight of McCann carrying his son in the exact same way he remembered the man carrying the girl in the streets of Praia da Luz jogged his memory to the extent that he realised the man in the streets was Gerald McCann. This bombshell evidence was kept quiet from the press back in 2007 and until Amaral’s book and the police files were released in 2008, this aspect of the case was publicly unknown. the monsters who engage in this particularly like going after blonde and blue eyed girls. (01-10-2017 03:32 AM)PRINCESS POOPYPANTS Wrote: [ -> ] the monsters who engage in this particularly like going after blonde and blue eyed girls. That seems to be the case. Maybe her parents gave her up to the elite in return for something, or in payment for something already received. This would explain why the investigation just goes around in circles, and some of the glaring anomalies posted in the OPs have not been questioned more. It would not surprise me if she was still alive. (01-10-2017 05:51 PM)Redneck Wrote: [ -> ] It would not surprise me if she was still alive. It would surprise me because of the blood at the scene and because the corpse trained dogs smelled corpse.